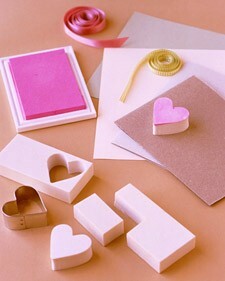 Valentine’s Day is one of the coolest holidays to use your rubber stamps to make gifts and decorations. Most of us who collect rubber stamps probably have several that would be appropriate for this lovely holiday like: lots of hearts, flowers, and other nifty stamps just waiting to be used to decorate and make gifts for a fun, romantic holiday. Are you giving your sweetie or someone else a wrapped gift for Valentine’s Day? Why not make your own gift tag for that gift? They will adore it. And, if the recipient is also a scrapbooker, then you’ve given them a lovely item that they can add to their Valentines Day pages as well. While I realize not everyone wraps Valentine’s Day gifts, the few times that someone has done this for me, it has been with wrapping paper they made themselves with rubber stamps. It’s a beautiful way to say how special the person is to you. And, as with a hand-stamped gift tag, this can make something pretty for a loved one who scrapbooks. Since Valentine’s Day is a day of romance, how cool would it be to take a cream-colored candle and add rubber stamped hearts or flowers to it? My husband bought one that someone had made a few years ago, and it was so pretty I couldn’t bring myself to light it! It’s a great romantic gift. And if your loved one does light it, it can make a beautiful centerpiece for a romantic dinner. Decorating for a romantic meal is easy when you make your own table linen using rubber stamps. Plain table linen is not difficult to locate, and you can use your stamps with fabric or fabric paints — both of which come in a wide variety of colors, allowing you to be as creative as you would like. Does your loved one like to collect little treasures? Maybe they need a small wooden keepsake box? If so, consider purchasing a plain one and then using your rubber stamps to decorate it. You can shellac it later to seal the designs permanently. You could also use this to put candy or jewelry in! If your loved one is a scrapbooker, consider making homemade blank scrapbook pages for them. And if you two have pictures taken this Valentine’s Day, that can be part of the gift as well. She will have those pictures to add to your homemade pages, making this a very special and memorable Valentine’s Day gift. The traditional (but fun!) handmade coupon book is another fun way to incorporate your rubber stamps into your Valentine’s Day gifts. Simply make a fun rubber-stamped card to hold all of your personalized "coupons". Those are just a few of the many ways that you can use rubber stamps to create beautiful Valentine’s Day decorations and gifts. There are many more. Perhaps with this list as motivation, you’ll be able to come up with even more fun ideas!